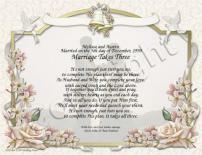 Personalize this beautiful wedding poem for the new couple. A gift that will be surely become a keepsake that will be cherished forever. 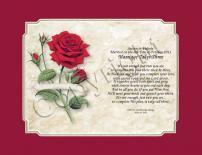 This is a beautiful wedding gift sure to please a new couple. 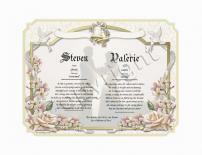 Includes the first name meaning of the bride and groom and the sentiment of your choice. 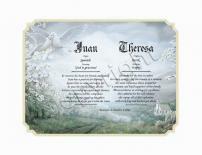 Bless a special couple with a beautiful wedding keepsake personalized with the meaning of their their names and add the sentiment of your choice for that extra Personal Touch. Ships from California within two business days.